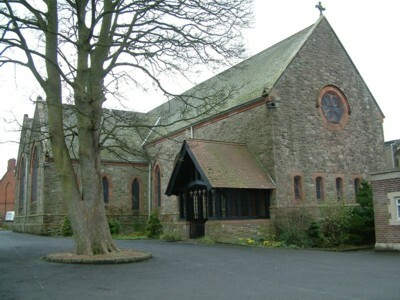 The Church of St John the Evangelist was built to replace a much smaller building that had been located nearby. The new Church was built on a traditional pattern with a graceful chancel, wide transepts and a small gallery. The interior is un-plastered and is of brick, whilst the exterior is sandstone. It has a slightly unfinished look from the outside, because of its squat tower which was never completed. Inside one is struck by the comparative darkness due to the fact that all the windows are of stained glass, some more heavily coloured than others. The Edward Garrett Memorial Chapel in the south transept is much lighter than any other area of the Church due to the brighter windows. The best of the stained glass, however, is in other areas of the Church. The east window based on the text “Suffer the little children to come unto me” is both the largest and the most prominent dominating the east end of the Church. 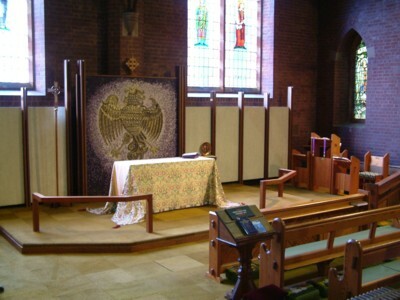 The chancel is raised several steps above the nave and has an intimacy accentuated by the wood panelling of the sanctuary and soft lighting of the choir lamps. The floor tiles between the choir stalls are particularly fine. The organ is situated on the south side of the chancel.. 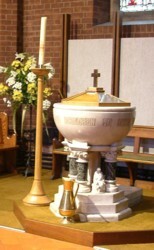 The baptistry contains not only the striking font, but also an historical corner. The information listed in it may be found under history. 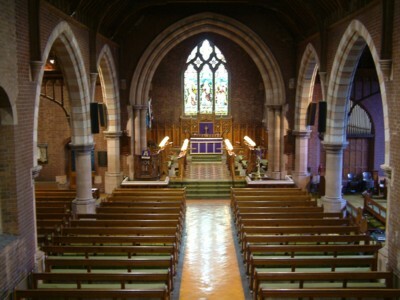 The nave seats about 400 people and may be reached through the north porch in the truncated tower or via the west porch, which also gives access to the Church Halls.